I haven’t posted in a while as i’ve started university and final year is quite stressful! Also, i’ve been thinking up some new ideas, and they’re more time consuming than my usual amigurumi. I’m currently making a set of girls in different coloured dresses. I wanted the dresses to have different shapes, but since this is my first time making these girls i’m going to play it safe for the first time and stick to one dress pattern for all four. I’m also working on Mikasa from Attack on Titan, and i’m so excited for how it will look once completed! The only problem is… i don’t know how to make coats or jackets! For the set of girls i want to make coats for them too, so this is a major issue! For this reason, it may take me longer than usual to make these amigurumi, but i will make sure they are completed! Once i know the basics for making a jacket/coat i’m sure the rest will be easy, so i’ll try and find some tutorials or example patterns to get me started. 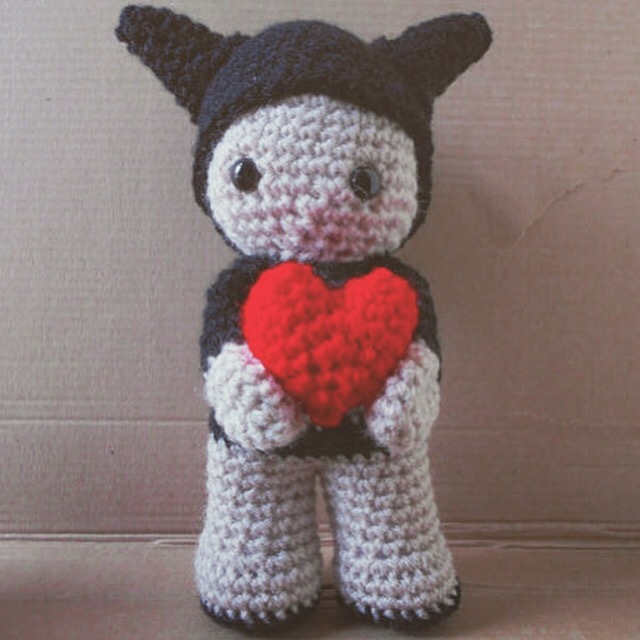 This week I have sold one of my favourite amigurumis. 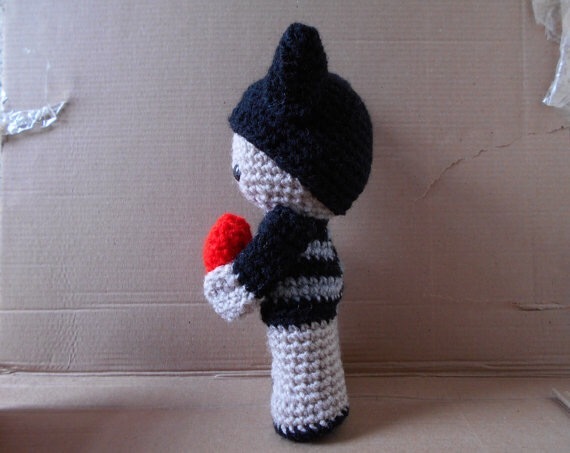 Black Soul Doll, made because even tough guys still need love. He wears black and grey strips and holds the red heart close to his chest. The heart is a gift for the person he loves and cares for, and he doesn’t just give it to anyone. You’re a very special person if this little guy is giving you his heart. This doll has given me so many new ideas, so I’m very happy to have made him and especially happy that he is going to share his love in a new house. I really hope his new owners love him as much as I do, so goodbye little guy.